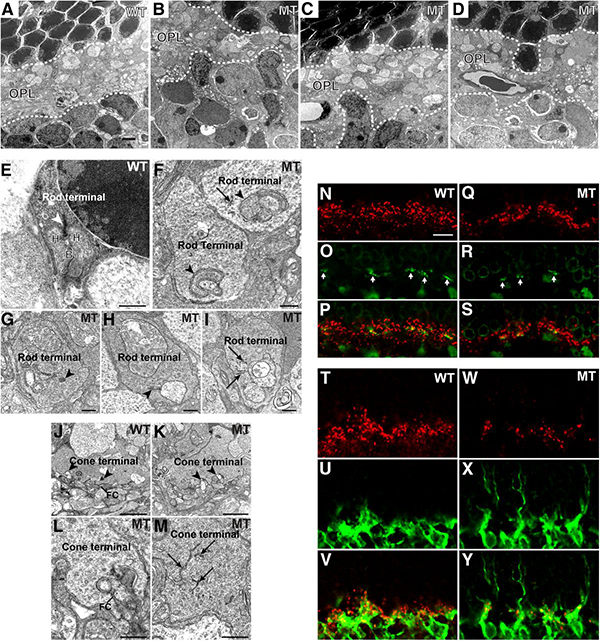 This paper, Onecut1 Is Essential for Horizontal Cell Genesis and Retinal Integrity in the Journal of Neuroscience by authors Fuguo Wu, Renzhong Li, Yumiko Umino, Tadeusz J. Kaczynski, Darshan Sapkota, Shengguo Li, Mengqing Xiang, Steven J. Fliesler, David M. Sherry, Maureen Gannon, Eduardo Solessio, and Xiuqian Mu describes the gene regulator Onecut1 as being the key to healthy retinal development and good vision in adulthood. Essentially, Onecut1 is critical for the formation of horizontal cells, but of fundamental importance to retinal degenerative research, this work implies that horizontal cells might be necessary for the survival of photoreceptor cells. Of course we have known for some years that horizontal cells are some of the very first cells to respond to retinal degeneration by extensively remodeling, but this is an interesting result that suggests a direct dependence of photoreceptors on the horizontal cells themselves for survival.